BUT, it's all done online through your own Online Apparel Store. For example, a School or a Church! In fact, because their service is free, I believe that all groups should set up an Online Apparel Store with them. They open up the potential for you to earn funds all year round, to increase the exposure of your cause, and without it costing you a cent. Like I said above, their service is free for anyone to use! Not only is it for nonprofits and fundraising causes, but it can also be used by companies and individuals. Of course they do only service the United States at the moment, but have plans in place to expand internationally, which is very good news! Their range of different apparel is also excellent and very wide. Look further down to see some of the Apparel Items that they offer. I really get excited about this fact, that they have such a fantastic range! 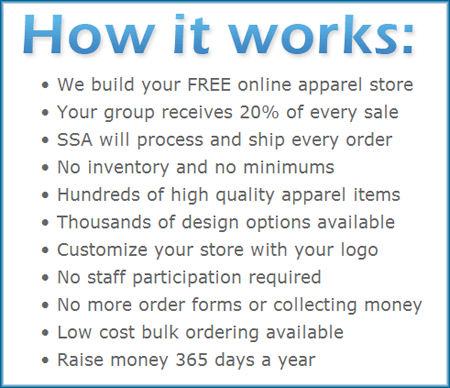 So basically you register your online store with SSA here, and then with their help you customize your store with your logos and colors. After that all you need to do is promote your store and it's Apparel to all your members, supporters, and potential supporters! It's a fantastic fundraising idea and fundraising resource! Getting The Most Out Of This Excellent Company? Well that is what the Online Apparel Fundraising page is for. It has all the advice there to help you run a profitable and successful Online Apparel Fundraising campaign through Spirit School Apparel! Use the best logos and mottos you can. They must be 'cool'! The right logos and mottos will help make your Apparel more desirable... Even though the Apparel is already excellent quality and highly desirable! Then promote like crazy, online and offline! Have samples and consider ordering stock to sell directly to people who don't want to go online to order. SSA's "low cost bulk ordering" option is perfect for doing this and you should definitely find out more about it. And finally be your best advert. 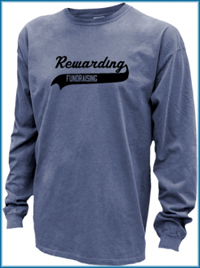 You and your fundraising team should wear and use your organizations apparel as much as possible. Spirit School Apparel has an awesome range of Apparel available and it's one of their most exciting attributes! 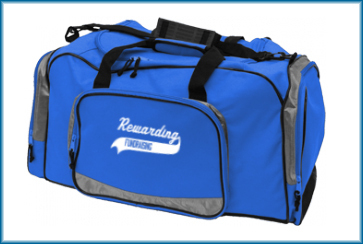 To use this excellent fundraising company simply register your Online Apparel Store here. But please make sure that you read the Online Apparel Fundraising page to ensure that you get the most out of this resource. It really has the potential of being a magnificent fundraiser for you, so make sure you do it properly!